The Sound of Life is a wonderful CD full of beautiful, relaxing and uplifting soundscapes ranging from chill out to dreamy melodic house songs that will make you travel to exotic beaches or energetic nightclubs. This CD will give you an audiovisual sunset. Gunnar Spardel, the man behind the project "Tigerforest", worked with outstanding guest vocalists on his selfmade debut CD. Amethyste is lending her beautiful ethereal soprano voice to eclectic chill out songs and progessive dance tunes, Kara JohnstadВґs powerful and sensual voice can be heard on the mystic "Colors of the Summer Sky". You can dance away on the progressive dance song "Transparent Days" sung by the wonderful Tiff Lacey (Paul Oakenfold, ATB) or "Riding the Wind" sung by Inga or just close your eyes and dream away with Jennifer Deann Scott on "Longing for the Sun". Listen to brandnew, original and unique sounding electronic music from one of the hottest newcomer in this music genre. "The Sound of Life" is a marvel of an album with an epic feel, including cinematic strings, deep bass lines, vibrant piano melodies, soothing vocals and warm atmospheric beats, placing you in the environment of a comfortable, relaxing crowd at the sunset beachside, calm waters rolling. 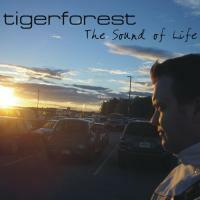 Behind this piece of art stands Gunnar Spardel aka Tigerforest, which music can best be described as clearly understated, 'trancy', and 'mellow' at times, while at other times its pure dance floor adrenaline. The album really has an eclectic range of soothing vocals like Amethyste, Tiff Lacey, Inga, Kara Johnstad, Amy Barbara and Jennifer Deann Scott, accentuating such a beautiful flourish of artistic resplendence. It leaves you mesmerized as time passes us by, our foolishness of not noting its splendor and leaving us to wish that we could, indeed, turn back time. This music surpasses the vibrancy and exotica of Ibiza to guide a listener through lush phases of synthetic strings, percolating dance rhythms and provocative acoustic samples to a sense of rejuvenated relaxation. This is really best experienced on headphones but you won't want to keep this technical yet movingly human masterpiece to yourself. Open your eyes, heart, and ears to a melodic tone that carries you from the laboring workload, into the skies above you, allowing you to explore what is the sound of life.